Now Ufone Official launched 3G services in Lahore, Karachi, Rawalpindi and Islamabad Ufone first Telecom operator who officially launched 3G services in Pakistan. Few days ago Ufone launched its 3G services in Rawalpindi, Islamabad, Karachi and Lahore which is free of cost for testing purpose but from 24th May 2014 all Ufone 3G services will be charged as per Ufone officially rates which we discuss below for Postpaid and Prepaid connections. 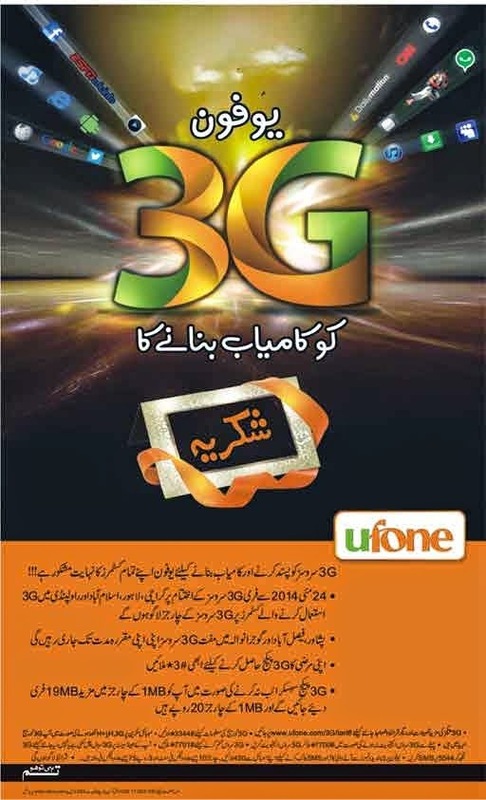 Ufone try its 3G services in more cities, Peoples in others cities enjoy Ufone 3G trial period without spend single penny like Faisalabad and Peshawar and till further updates from Ufone official.